This is the first gaming article on Zelgerath.com which was not written because of a Random Number Generator. I’m writing this because I feel that it could help a lot of people who are aiming to 100% complete The Legend of Zelda: Majora’s Mask 3D. 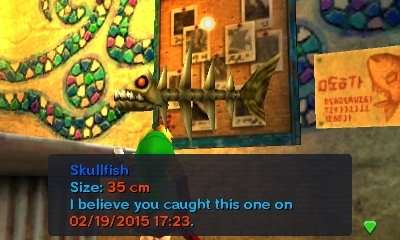 I have recently played The Legend of Zelda: Majora’s Mask 3D to 100% completion. Most of the game is essentially identical to the original game that people know and love, so guides for the original game are very useful to anyone playing the remake. However, a brand new fishing quest was added to the 3DS Remake which has been an unexpected challenge. Because the fishing in this game is new and only a side quest, there isn’t a lot of reliable information about how to catch all 24 fish in the game, so I decided to write this simple guide to help those of you who are attempting to catch all the fish. I owe much of this information to helpful threads I found online, but it’s here that I want to compile the results and details of my experience with this side quest. 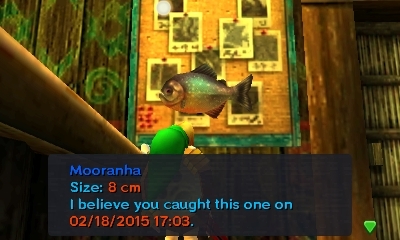 There are 2 Fishing Areas (Fishing Holes) in Majora’s Mask 3D. One is in the Swamp and the other is by the Ocean. Each area has 12 fish to catch, 3 of them being considered “Boss Fish”. 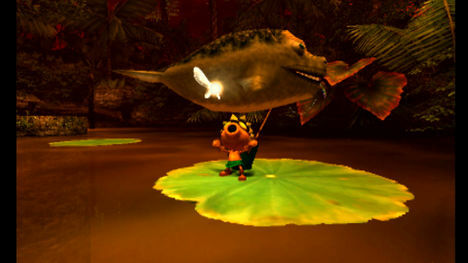 There are 6 “Boss Fish” all together, but you’ll only find 3 in the Ocean Fishing Hole and 3 in the Swamp Fishing Hole. When you enter a fishing hole, the fish will load inside of the water. It is random what appears but not completely (but I’ll get to that later). You don’t have to pay for a fishing rod to check if a specific fish is there or not, so I recommend not paying unless you know there’s a fish you want inside the water. Otherwise, if the fish you’re looking for isn’t there, exit the fishing hole and come back in to check for it again. I did this quest after 100%ing the rest of the game, so it helps to have every mask and a ton of money. A common fish; very easy to find. Learn the basics of fishing catching these. Slightly less common fish; I’ve seen them near the bottom, so definitely learn to use the sink lure. 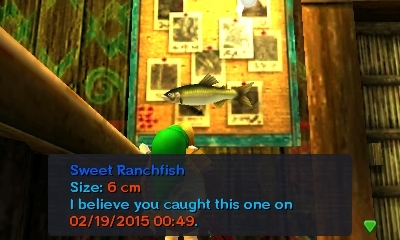 This fish can only exist between 6AM and 3PM. 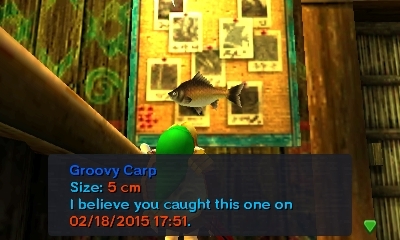 It has a chance of appearing if you enter the Fishing hole at or after 6AM, and at 3PM, if they’re in the Fishing Hole, they will disappear, even (I hear) if it’s hooked on your line. and play Epona’s Song using your Ocarina (It might work with the other instruments, but I don’t know). If it’s there, you should hear a “Success Chime” and there will be ripples at its location until the song wears off. While there are ripples, try getting the bait close to it as you can and it may bite. If the ripples stop before you can catch it, play Epona’s Song again. To check if it’s there, stand at the water’s edge with your feet in the water and put on the Mask of Scents. If nothing happens, leave the fishing hole and come back. Try again until wearing the mask makes you hear a chime and you see at least one purple cloud on the surface of the water. They have a strong smell, so a purple cloud indicates its location. To check if it’s there, wear Romani’s Mask (The Cow Mask) and stand on the water’s edge with your feet in the water. If it’s not there, leave the fishing hole and come back. Try again until you hear a chime and ripples appear on the pond. The ripples tell you where the fish is. From 6AM to 9PM, this fish may be moving around the pond in a fairly uniform pattern. If it’s there, you can stop it in its tracks by wearing the Postman Hat. A chime will play, and then you can catch it fairly easily. 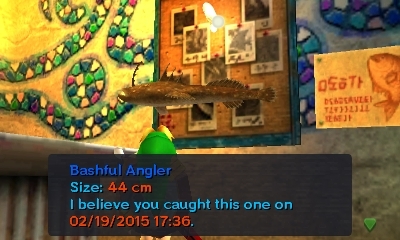 This fish cannot appear on Day 2. All other times are okay. To check if it’s there, go to the edge of the water and march with the Bremen Mask. If it’s there, a chime will play, and for a while, there will be ripples, which means that it is willing to take your bait. If the ripples stop before you can catch it, march again with the Bremen Mask and the ripples should start again. This fish is based on the Coelacanth, a prehistoric fish that lives in deep water. As such, you might find this one at the bottom of the pond. The quickest way to check would be to go into the fishing hole as a Zora and walk to the bottom of the pond to see if any are there. Alternatively, you can check by wearing the Gibdo mask and listening for a chime. 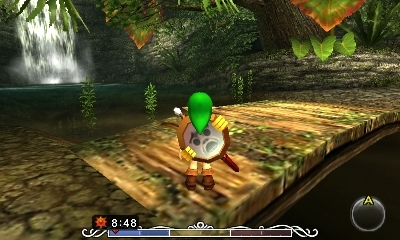 You must wear the Gibdo mask to make its ripples appear so it can be caught. 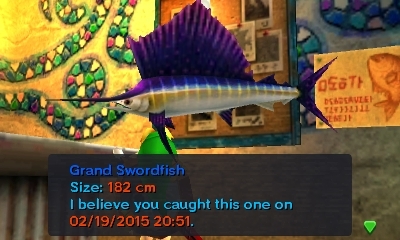 This is one of the six “Boss Fish”. 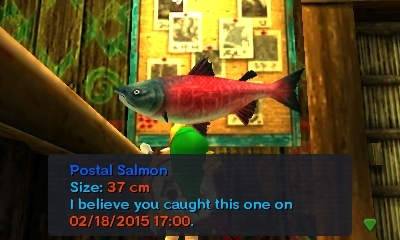 To make Boss Fish appear, I recommend catching a lot of fish on Day 1 (I’m just guessing 20 is more than enough). Make sure you are using the song of double time to slow time. It doesn’t matter where the fish are caught, so I would recommend fishing in the Swamp because the fish are easier to catch. If you run low on fish in the pond, leave the fishing hole and come back in. After you have fished for awhile, save your progress at an owl statue, because it is now possible to encounter a boss fish. If you fail to catch it and run out of time, you can return to your last save point and try again. To check if this guy is in the pond, go into Zora form and walk to the bottom of the pond. If it’s not there, leave the fishing hole and come back. If it is there, you want to hook a fish on your line near him. 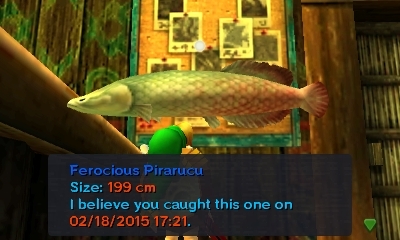 Don’t reel the smaller fish all the way in, but instead use it as bait to catch the Ferocious Pirarucu. If it grabs the small fish, you have to hook him with the circle pad as if you are catching a new fish or he’ll get away. The boss music will play. Enjoy. 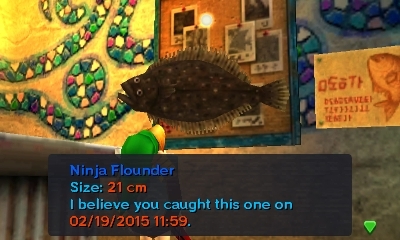 This fish can only be found on the final day. To check if it’s there, you need to hop to the island in the middle of the pond using your Deku form, and then pound the ground using your Goron form. This is the only reliable way to check, because without shaking the lake in this way, the fish will be invisible. If you hear a chime, the ripples will appear and you can try to catch it. If the ripples stop, just pound the ground on the island again. When you hook it, the boss music will play. Enjoy. This is the Master of the Swamp; A baby Lord Jabu Jabu named Lord Chapu Chapu. 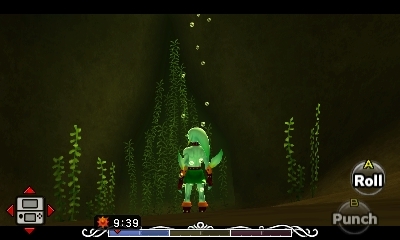 To check if this guy is in the pond, go into Zora form and walk to the bottom of the pond. 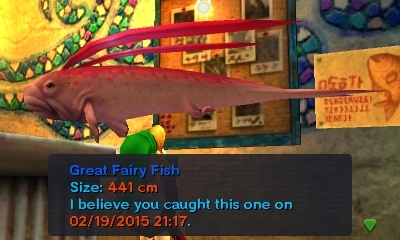 If it’s there, it should be sitting in a small underwater cave on the east edge of the pond. If it’s not there, leave the fishing hole and come back. If it is there, you want to hook a fish on your line near him. 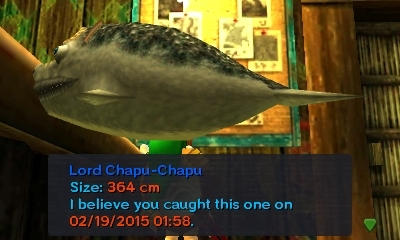 Don’t reel the smaller fish all the way in, but instead use it as bait to catch Lord Chapu-Chapu. If it grabs the small fish, you have to hook him with the circle pad as if you are catching a new fish or he’ll get away. The boss music will play. Enjoy. 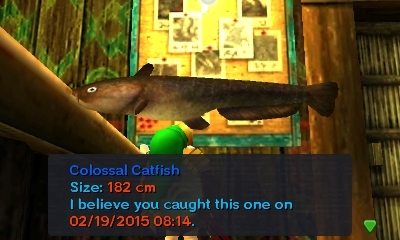 A common fish; pretty easy to catch. 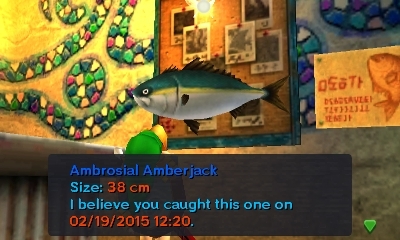 I don’t 100% remember, but you might need to use a normal fishing lure. I had trouble using the sinking lure. A common fish; pretty easy to catch. A common fish; tends to be in the far north. Swim around while wearing the Stone Mask, and if there’s a chime, it means it’s there. Ripples indicate its location. It can only appear during the day. Dance using the Kamaro Mask for a few seconds to check if it’s there. There will be a chime if it is. If the ripples wear off, dance again. Swim around while wearing the Great Fairy Mask. I don’t remember if there’s a chime or not, but ripples indicate its location. It tends to be in the east near the underwater fairy cave. Swim around while wearing the Garo Mask, and if there’s a chime, it means it’s there. Ripples indicate its location. It can only appear at night. Swim around while wearing the Skull Captain’s Hat, and if there’s a chime, it means it’s there. Ripples indicate its location. 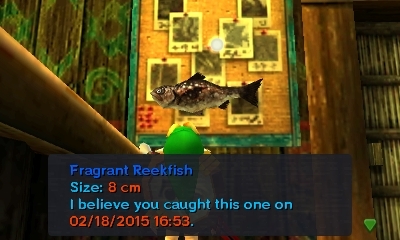 This fish cannot appear on Day 2. All other times are okay. Swim around while wearing the Couple’s Mask, and if there’s a chime, it means it’s there. Ripples indicate its location. This guy is pretty darn tough. He’s pretty easy to check for though. 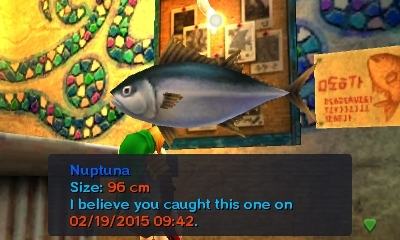 Go into the ocean as a Zora and check if it’s there. It can be around any of the small islands. If it’s not there, leave the fishing hole and try again. 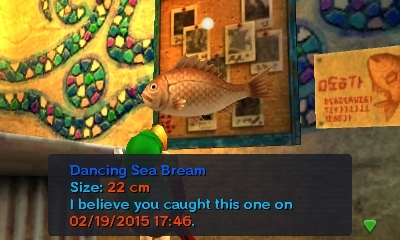 I think I eventually caught him using a normal fishing lure instead of a sinking one, but I don’t remember. 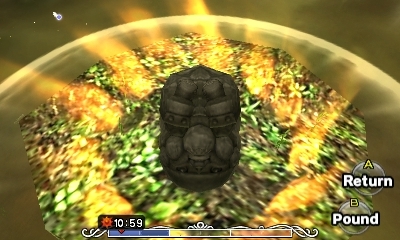 It’s possible that you need to be wearing the Goron Mask to reel him in successfully. When you hook him, the boss music will play. Enjoy. These guys usually spawn as a group. When they appear, I have usually seen them in the southeast. 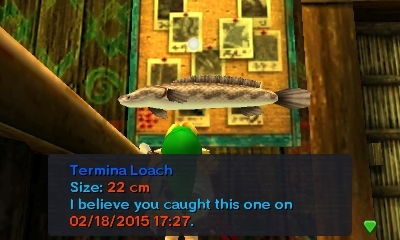 To check if they are in the fishing hole, go into Zora form and walk to the seafloor. If it’s not there, leave the fishing hole and come back. If it is there, you want to hook a fish on your line near one. Don’t reel the smaller fish all the way in, but instead use it as bait to catch the Savage Shark. If it grabs the small fish, you have to hook him with the circle pad as if you are catching a new fish or he’ll get away. The boss music will play. Enjoy. This is the Queen of the Ocean; A creepy looking fish that has the same haircut as a Great Fairy. 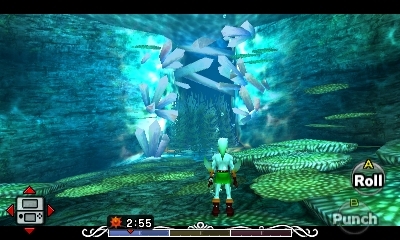 To check if this thing is in the fishing hole, go into Zora form and walk to the small underwater fairy cave in the northeast. If it’s there, it’ll be sitting in that cave, but you have to look carefully. If it’s not there, leave the fishing hole and come back. Once you know that it’s there, you want to get a Fairy Fish onto your line. 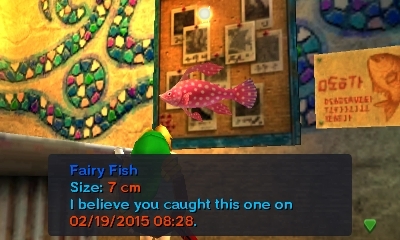 Remember to use the Great Fairy Mask so it will be willing to take the bait. Don’t reel the Fairy Fish all the way in, but instead use it as bait to catch the Great Fairy Fish. 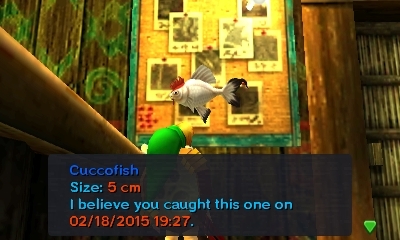 When it grabs the Fairy Fish, you have to hook it with the circle pad as if you are catching a new fish or it’ll get away. The boss music will play. Enjoy. I hope this brief guide has helped you 100% this game. Don’t forget to share this article if you found it helpful! Thanks for Reading!